In a little over a month it will be one of my favorite days of the year – Halloween! I’ve always enjoyed dressing up and trick-or-treating when I was little. I remember being so sad when I was in first and second grade because I couldn’t go trick-or-treating – in first grade I had pneumonia and was actually in the hospital. Then in second grade I was sick again but luckily was not hospitalized that year. I was the oldest child and my brother was so cute and sweet that he would trick-or-treat for the both of us – being sure he would tell everyone that his big sister was sick at home. When we were a little older we spent most of our Halloween nights with our good family friends and used his HUGE neighborhood to stock up on candy for the year! I remember one of the last years we all went out I even dressed like Madonna (circa 1980’s) – which wasn’t too far away from my normal clothes but it gave me an excuse to cake on the make-up. Now as a parent we have our own traditions. For the last several years our best friends (Mama M’s family – along with a few others) all join us in our neighborhood (the most kid friendly) for some dinner and trick-or-treating. I usually end up making chilli and some kind of vegan dish for Mama M – and mac-n-cheese for the kids. We’re very predictable! Our neighborhood isn’t all that big but it’s perfect size for the wee ones – who aren’t so wee these days. And depending on what day Halloween falls on – we’re normally watching college or pro football as well. It’s one of my favorite times of the year and I can’t believe it’s almost here again. I guess it’s time to pull out my tutu from last year and decide what I’m going to be this year. Except I think I’m going to pass on the purple hair dye this year! For a few years now I’ve seen information about GreenHalloween.org – a non-profit organization trying to create a healthier and more eco-friendly Halloween experience. We already live a pretty green lifestyle but there is a lot of room for improvement. We still allow our children to purchase their own costumes if they want – and we still purchase traditional Halloween candy. Aside from that our Halloween is fairly eco-friendly. We don’t go over board on decorations and we do reuse those each year if possible. So where else can you actually green your Halloween? Remember it’s not just about being eco-friendly – a Green Halloween is one that is good for people (healthy), good for the planet, and good for the community (giving back). An easy place to start greening your Halloween is by organizing or participating in National Costume Swap Day – October 9th. The costume your child wore last year was probably worn for less than one full day – even if you add it to a dress up box. Our local library collects costumes year round so that they can provide Halloween costumes to families in need. 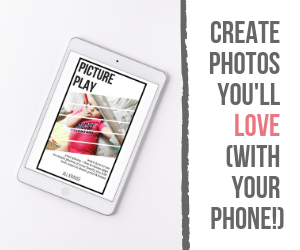 This would be a great project for a church group, a class or school, boy scout or girl scout troops, or a playgroup. It’s easy to organize a swap of any size – Green Halloween & KIWI Magazine have some tips to help you out. Here are some more simple changes you can make this year – start small and incorporate a few new ideas each year. 1. Choose a healthier treat to hand out. Don’t worry about the kids rejecting your treat – most parents these days don’t allow their kids to eat a bunch of sweets and will probably appreciate the healthier options. What are some small healthy treats? Organic juice boxes, organic candies (such as Surf Sweets), fruit pouches (like Mashups), organic or fair-trade chocolates, fruit leather, raisins, or honey sticks. We don’t have a ton of kids in our neighborhood so it wouldn’t be hard to pick a low cost, healthy treat this year that the kids would actually enjoy. 2. Choose a non-food treat to hand out. Just be sure to be careful in what you select – while the kids may enjoy those cheap plastic toys, they can be loaded with toxins and end up in the trash the next day. Some better choices include pencils, eco-friendly play dough, activity books, soy or beeswax crayons, etc – the possibilities are endless. 3. Make your own costume or buy from a thrift store. Kids costumes don’t really change much each year. Being in Florida we have another challenge – October is typically still very warm out. For the last few years the kids are stripping off the accessories from their costumes before we get to the end of the first road. Keep the costumes simple and try to use what you already have. For instance – my daughter loves to play dress up and has a few Cutie PaTutu’s – her red and black tutu can easily be used as a ladybug costume! Use one of daddy’s dress shirts and the frame from some old glasses to make your child a scientist (lab coat). Have fun with it – and try not to let commercialism take over your Halloween. 4. Reverse trick-or-treat! Your kids can be little advocates for your neighborhood – whether you support fair-trade chocolates or want to encourage your neighbors to recycle – pick a little treat and attach a message to it. Take your treats with you and hand them out as you trick-or-treat this year. They will probably bring a smile to a few faces in return. This is a good project for a youth group or church group to participate in too. 5. Don’t forget the reusable bags. Those reusable shopping bags from the grocery store would make great trick-or-treat bags. If they can hold all your groceries they will be strong enough to carry your child’s loot! Want to learn more tips on greening your Halloween? 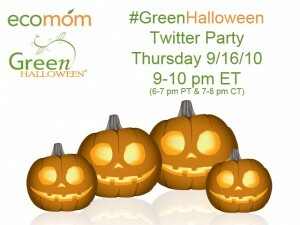 Join Eco Chic Parties, EcoMom®, and Green Halloween for a #GreenHalloween Twitter Party. For more information on how to participate and on the great door prizes visit Eco Chic Parties.